2. เลย [leoi] is used for emphasis at the end of a statement, similar to the English words – so much!, extremely!, completely! indeed! ผมหิวมากเลย [pŏm hĭu mâak leoi] means I’m very hungry. หนังไทยสนุกมากเลย [năng tai sà-nùk mâak leoi] in English it would be Thai movies are really fun. 3. จัง [jang] , จังเลย [jang leoi] is also used for emphasis at the end of a statement. It is informal. 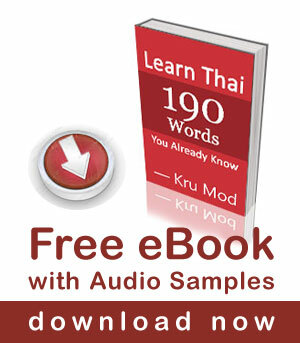 ภาษาไทยง่ายจังเลย [paa-săa tai ngâai jang leoi] = Thai language is very easy. อาหารไทยอร่อยจังเลย [aa-hăan tai aròi jang loei] = Thai food is very tasty. ลูกแมวน่ารักจังเลย [lûuk-maew nâa-rák jang leoi] in English it would be ‘What a cute kitty! NOTE: There is a difference between มาก [maak] and จังเลย [jang leoi], when you use them to describe some quality or feeling. They are both quantifiers, maak denotes “very” when go with an adjective, while it means much/many when used with a verb or noun. On the other hand, จังเลย [jang leoi] carries the speaker’s personal feeling with it and therefore it sounds much sweeter and more personal. เขาไม่กินอะไรเลย [káo mâi gin à-rai leoi] = she is not eating anything at all. ที่นี่ไม่มีร้านอาหารญี่ปุ่นเลย [tîi-nîi mâi mee ráan aa-hăan yîi-bpùn leoi] = there is no Japanese restaurant here. I get google translate “have you eaten yet” to “คุณได้ กิน เลย”. Is that a correct use of เลย? Thanks khruu Mod. Please help us to provide the video link for the same. That will help a lot. Sawasdee krap kun Mod.how can i prononce “leoi”? Is it loy? Kopkun krap. Sawatdee ka Kun Alain, You could try to pronounce “ler” (don’t roll your R) and then add the ‘yi’ sound (make it very short and quick) at the end. I don’t believe I have seen เลย transliterated into “leoi” before. Usually I think they spell it “loei”, although I would argue that neither one fully describes how to actually pronounce it, so maybe a moot point.